“More than we thought we wanted” – Habitually Being: thoughts worth living. What we want is not what always what God gives. That is good news. A sermon delivered at 7th & James Baptist Church. Waco, TX. 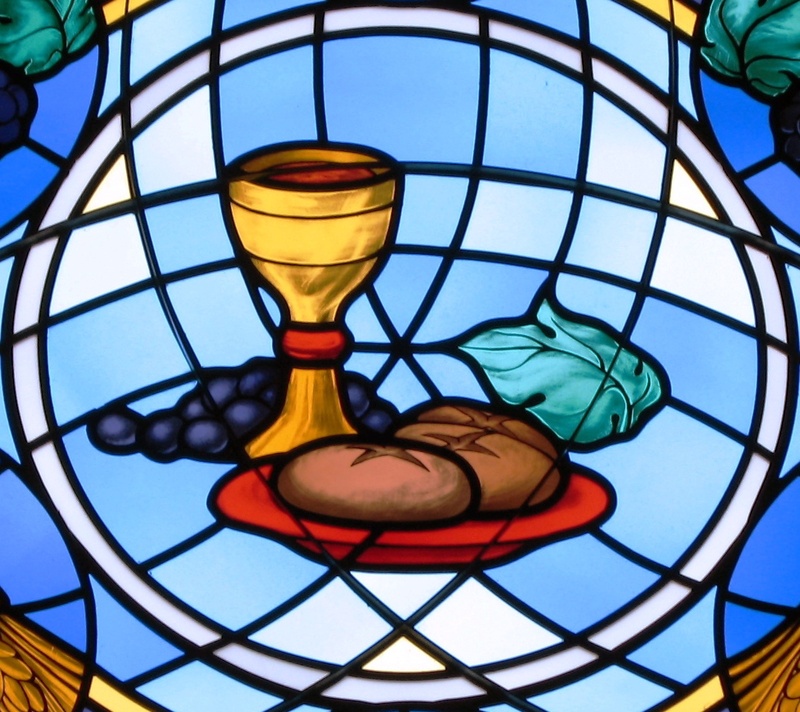 St. Michael the Archangel Parish, Findlay, Ohio: Eucharistic stained glass window depicting bread and wine. From wikimediacommons user: Nheyob. Use does not imply creator of image supports or endorses the ideas expressed here. Despite our twisted desires, and our misunderstandings, God offers us more than we could imagine, and empowers the church to witness to the eternal bread of Life in Jesus– who is the true answer to human longing. The lectionary has us in a “deep dive” into John right now. And it can’t help but remind me of a bit by comedian John Mulaney. He grew up Catholic and had a bit explaining what church is to non-church going friends—as someone who has put the whole “church thing” behind him. (It’s going to get playfully irreverent, but it will come back around). And then an usher—who is not a trained singer— sings a psalm. And his imitation of a psalm from the perspective of a someone who has not-been-to-church in a while is what gets me. And then the guy does this *and gestures upwards* which means we’re supposed to sing our lines. Except we don’t know our lines [at all]. “Where’s that pamphlet they gave us? Move that jacket! Our deep-dive into John 6 may have us wondering the same thing: what’s all this about bread? And we could leave ourselves open to lots of misinterpretation. Like Mulaney, the people seem confused about what all this bread-talk is about. In this passage, the people come to Jesus. And Jesus DOESN’T answer their question about how long he had been there, or when he got there, but immediately tells them that they did not come to him because of any signs—but because they ate the bread. Now, at first, Jesus may seem a little confusing here. After all, last week, we read the story of the feeding of the 5,000 in John. And that seemed like a sign—a miracle— all right. But while they saw the sign, they had NO idea what it means. They only knew, amazingly, they had been fed. In fact, the whole reason Jesus left is that after the feeding of the 5,000 is that they mistook him for a political savior. [Jesus left] “[w]hen Jesus realized that they were about to come and take him by force to make him king” (Jn. 6:15). They may be looking for Jesus for a good reason, an understandable reason. But Jesus says they’re not looking for him for the right reason. “Do not work for the food that perishes, but for the food that endures for eternal life, which the Son of Man will give you.” (Jn. 6:27). Can I ask you why you’re here? Why spend your Sunday like this? It’s a question which, I’m sure, all of us have wondered at one point or another. And it’s a question which is increasingly common. The statistics are clear, especially about my generation. Attendance and religious affiliation are down. Nearly 40% of younger millennials claim no religious affiliation. These are the “nones.” There are also the “dones”—those whom still are religious but have no use for church. They are not “unbelievers.” They are burnt out—finished. Done. Alarmingly, some claim politics are driving one’s religious affiliation. Others point to the theology of the churches driving people away. Even demographics, people marrying later and having fewer children—because those with children are more likely to want to find a church— have been used to explain this phenomenon. And, the thing is, all these reasons and more may have some truth to them. But the “dones” in particular show us that what FIRST draws us to faith—and what drives us away—might have little to do, well, with God. In a book called Church Refugees two sociologists did extensive interviews with 100 people who were just done with church. Another person complained not of the people but of a bulky system in the church. She complained that you had to go through three committees to get a church lunch together—something which seemed like it should be so simple. Allison, an aerospace engineer interviewed, complained that church seemed too much like the complicated systems she dealt with at works. “I get it… You need rules and regulations. But you should be able to be empowering too,” she lamented. And this is to say nothing of more egregious offenses, like hurt and abuse, which make people find church impossible. There are all sorts of forces which isolate us from God and others. Such Powers make relationships where people realize they’re actually loved, seem so difficult. The church is given by God, but she is neither immune nor innocent in this. I wonder when we made the shift from hospitality to entertainment. Community is going to your neighbors to borrow a cup of sugar, and your spouse having to come looking for you because you and your neighbor “got to talking”. Hospitality is the “southern goodbye” where you linger by the door for thirty minutes talking, stretching out the evening. That’s community. Entertaining is something you do twice a year, it’s a massive event, and even when EVERYTHING is going wrong—the pot roast is burnt, your kids are being unholy terrors, you’re hiding new carpet stains under the rug— YOU have to smile and act like everything is so effortless and easy when it’s an exhausting production. Perhaps there’s something for us to learn there. Hospitality isn’t the same as sharing God with others, but there is no such thing as inhospitable evangelism. So while sometimes the attractions and barriers to faith seem to have very little to do with God—at least at first glance, there’s good news. God doesn’t give us exactly what we come looking for. Nor does God leave us with what we first came seeking. God-in-Jesus-Christ gives us so much more. The crowd first expected a military savior, a King like David. Then Jesus tells them not to seek after bread which will decay but eternal bread. What they followed him for is small compared to what he has in store for them. They ask what they must do to get this bread. They’re missing the point. But Jesus does not give up on them. The work is faith, the work is relenting, to God’s work in Jesus Christ. The work is given to us. And this, this of all things upsets the crowd. Because not only do we come with our own desires, but often we want to dictate how they are fulfilled. And here Jesus is telling them their desires are too small, and their works unneeded to attain what they truly need. They want a sign. Show us manna, like our ancestors received bread from the sky. Jesus is trying to prepare them to understand, but they’re still thinking in terms of physical bread. Not teaching. Not instruction. They’re certainly not thinking of Jesus as who he is—the only one who has come down from the Father in Heaven. What do we do to get this bread of heaven? Do we sing LOUDER so God can hear us? Do you have some proof that you are who you say you are? Where is the sign? And Jesus is patient with them. It’s not Moses who brings true bread from Heaven. This bread is different, bread which gives life to the world. The needs of the world are great. And in meeting those needs, God opens eyes and hearts to understand our deepest needs. Some of our Meals-on-wheels volunteers have worked for years. They have cooked, delivered, spoken with those whom are given meals, and re-arranged their routes so, at the end, they might linger for those they know especially want to talk—those who may not have many people to talk to. And they can tell you first-hand how they’re not just fulfilling the need for a meal (as important that is). They have seen how this one need, opens the door to see many deeper needs—and to see God at work in meeting them. Inspired by the worship services here at 7th and James, Jane Newsom asked Pastor Erin to see if the congregation on a Wednesday night would write blessings for those on the Meals-on-wheels routes. Dozens were written, and continue to be given out with meals. One Meals-on-wheels deliverer took a blessing with her and visited with a woman on her meals-on-wheels delivery route. She visited, and talked, with the woman and asked how she was doing. The woman looked downcast. In fact, one struggled to remember the last time she smiled. But today she looked especially down. She had cancer. And she just learned it has metastasized. She received the blessing which conveyed this hope: That God’s presence would be known to her this day, and that God’s peace would stay with her right where she is. The people who followed Jesus had no idea what they were looking for. They seemed confused even about what Jesus had to offer. But the physical bread he had given them led them to seek anyway. And what Jesus had to offer was more than they thought they wanted. When we think of the ways we go out into the world, we think we may just be providing a meal. But it wasn’t just a meal. It wasn’t just a conversation. And the blessing wasn’t just a piece of paper with writing on it from our church. In our everyday actions, the Holy Spirit is at work. The Spirit unfailingly draws us unto the love and person of Christ. Through simple faithful gestures, God works. God gives hope and assurance. God directs us to the gift of the bread of life in Christ. Who could have known that a blessing would give a woman full of uncertainty amid her medical treatments hope? I wonder if even she knew that would be “exactly what she needed”. Chris Green wrote a book called Surprised by God. One thing he says is that when we confess we are sinners, that our desires are too small, or pointed in the wrong direction, to acknowledge we do wrong, it’s not a self-hating act. It’s liberating. He says that while God is our homeland, we are so fearful, so caught up in lies, in our failures, and the wrongs done to us, that we don’t always find God to be the One we want. Our desires aren’t all-out evil, but they are, in a way, bent. But God uses even those desires to draw us to the one whom we find lovely only by God’s action, God’s grace, and God’s love for us. We can approach Jesus with anything. But what we ask for is not what we will always get. Because we will receive more than we thought we wanted. Despite our twisted desires, and our misunderstandings, God offers us more than we could imagine, and empowers the church to point to the eternal bread of Life in Jesus– who is the true answer to human longing. And that’s why God surprises us. As Green says, “God loves us too much to let us settle for the god of our own imagining. He scandalizes us in order to deliver us from illusion”. We may seek justice by “getting even”, but Jesus comes to us in the scandal of one who was wrongly condemned and killed on the cross. And that same one rose again and will wipe every tear from our eyes. We may come lonely, wanting love, and seeking to please others, but Jesus comes the one who says the work has been done and our work is to surrender, to rest, in him. Knowing that all of our acts of mercy, can’t help but be used by God. The allure of Christ’s gentleness sets us free. Because with Jesus, we’ll never go hungry again. John Mulaney, Kid Gorgeous (2018). At the time of posting, it is available on Netflix at: https://www.netflix.com/title/80238110 (Warning, strong “vulgar” language throughout). Church Refugees: Sociologists reveal why people are DONE with church but not their faith. Group Publishing, 2015. https://www.amazon.com/dp/B00XUUZC9G/ref=dp-kindle-redirect?_encoding=UTF8&btkr=1 No page numbers included, as all quotations are from the Kindle version. I thought the suggestions given by the authors (who are sociologists) would have benefited from them engaging with theologians who study ecclesiology. While the conclusions are not always agreeable, the perspectives of those who have left church, from the ones finds most sympathetic to the least, are worth reading for anyone wondering what people are sayingabout why they leave church. The following anecdote taken from a person interview with Jane Newsom. After a person interview, I transcribed what I remembered and sent it to her. She approved of the anecdote as it appears. I have kept the name of the deliverer and meals-on-wheels recipient out of the story deliberately. In this section, Dr. Chris Green is undoubtedly influenced by Augustine.